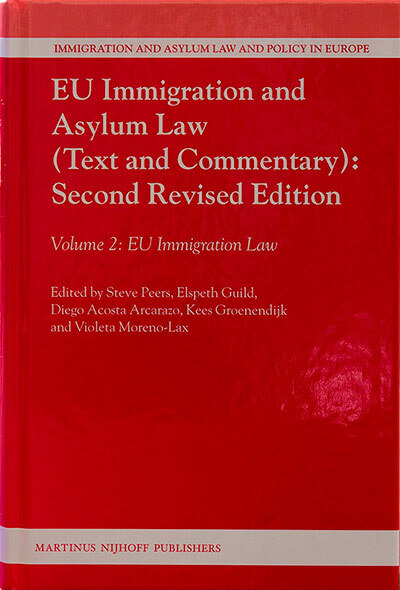 Since 1999, the EU has adopted legislation harmonizing many areas of immigration law, in particular rules on borders, visas, legal migration, and irregular migration.The much-enlarged and fully updated second edition of this book contains the text of and detailed commentary upon every significant measure in this field proposed or adopted up until 1 September 2011. It includes commentary on the EU visa code, the Schengen Borders Code, the Frontex Regulation, the Returns Directive, the Directives on family reunion, long-term resients and single permits for migrant workers, and many more besides. This is the essential guid e for any lawyers, academics, civil servants, NGOs and students interested in this area of law. Cited by Advocate General Szpunar in Case C-544/15 in Sahar Fahimian v Federal Republic of Germany, delivered on 29 November 2016. Marija Jovanovic, International Journal of Refugee Law, 25 (2014), pp. 842–850.